I’ve been having such fun just now. There’s a couple of photos circulating and my friends are really enjoying them. This one is in Buenos Aires. It’s in an old 1920s theatre and the possibilities are endless. I would have liked to embed the photo here but they’ve done something clever and it’s not possible. So, this next one is a video and I’ll send you through to The Bookshop Blog to watch this one. It’s a bookshop in an apartment in the US and it’s truly an education. You can read more of my writing there as I’m one of their regular writers. At this point you can stop and have a think about your local bookshop and what makes it a bookshop. Is it the shelves? Or maybe it’s the types of books, sometimes it could be the people behind the counter. This article is about the layout and the building. I’ve participated in a number of conversations about second hand bookshops this week and yesterday it was fortuitous as we we’d left the book launch and were walking down Chapel Street when my OH pointed out a building across the road which used to be a secondhand bookshop. It was one of the shops mentioned in a previous conversation and he told me it used to be a fantastic bookshop and took up all three storeys of the building. I didn’t think to take a photo but it doesn’t sell books now. I’ve been wanding around the web looking for various bookshops and have hit a goldmine. Here’s a glorious one at Vilnius University. Take note of the frescos. 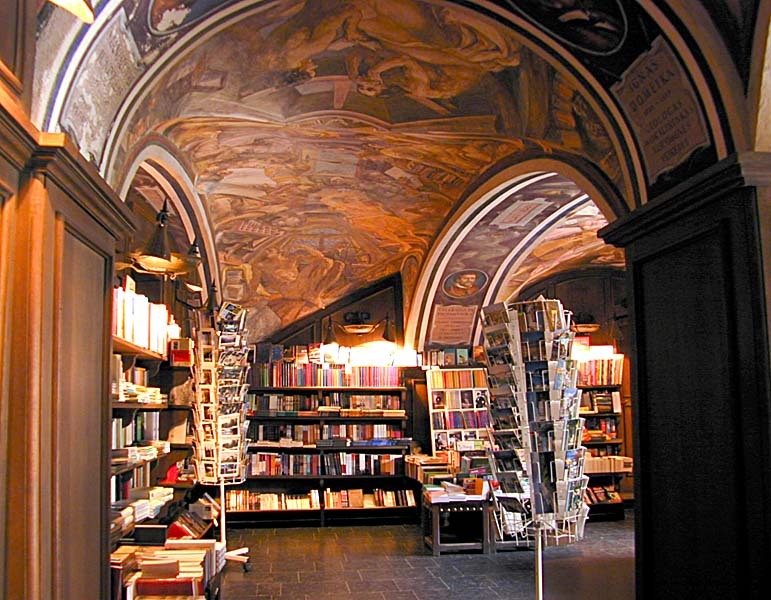 I like to visit different bookshops and there are some really different ones around. There’s this first photo in Lausanne which I feel is rather sterile and I wouldn’t be comfortable in it and the next photo is one in Sydney which is the opposite and I’m definitely not comfortable there either. This next link is an article in the Guardian and you’ll find 10 fabulous bookshops in this article including the one from Buenos Aires. Another thought. Do you prefer small bookshops or would you prefer to visit a large bookshop and get your daily exercise just by browsing the shelves? My final thought will be this website with a focus on Shanghai. The first article is on a bookshop in Fuzhou Road. It only has 27 storeys of books.